With the current renewed interest in questions left unanswered since the Viking missions, Mars science is presently progressing more swiftly than ever. New observations are gushing in from Phoenix, the Mars Reconnaissance Orbiter, and Mars Express. As James Bell comments, ‘Mars is a moving target, but at some point one has to let the arrow fly’. In The Martian Surface, Bell’s arrow strikes in the early days of MRO, before the launch of Phoenix and just as the Mars Global Surveyor is finishing its nine year marathon. This comprehensive collection of in-situ and orbital observations of the Martian surface is the result of nearly 100 contributors, spanning the field and globe, combining their insights and discoveries from the last 15 years of Mars exploration. The freshness of this area of science and the excitement of being involved in it at this time is communicated throughout. 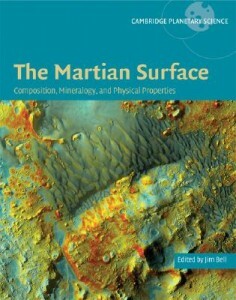 Featured in this book alongside some of the first HiRISE images from MRO are results from the Mars Global Surveyor, Mars Odyssey, Mars Express, Mars Pathfinder, and the twin Mars Exploration Rovers. There are several entries that describe the surface chemistry, drawing on observations from the APXS on the Pathfinder and twin MERs, the Mars Odyssey GRS instrument and the Neutron Spectrometer. Another large section is devoted to remote and in-situ multispectral mineralogy observations from OMEGA on Mars Express, TES on Mars Global Surveyor, Mars Odyssey’s THEMIS. The diversity of the Martian surface and its rich geologic history is conveyed by the wealth of observations that are discussed. Supplementing this inspection of chemistry and mineralogy is an examination of global and local physical properties such as surface albedo, surface roughness, grain size, and porosity of surface materials. An extensive amount of information discussed in the text is presented pictorially in the colour plate section, which displays mineralogical maps from OMEGA, TES, and THEMIS and surface images from THEMIS, HRSC, HiRISE, and Pancam mosaics. This section also includes depictions of crustal magnetic fields, thermal inertia and surface albedo, topographical maps and Mössbauer spectra. For those who wish to find quick and easy access to the main results and observations discussed in the text, this comprehensive section is where to turn to. Although some early observations from MRO are included, there is no mention of observations from its CRISM instrument, a dataset that was utilised extensively alongside THEMIS in the recent landing site selection workshops for the Mars Science Laboratory. Of particular interest for those of us in Europe are the observations being taken by our own mission, the Mars Express. The book includes OMEGA’s most important findings at the time, such as the identification and mapping of the distribution of frost, ices, and primary igneous as well as secondary altered minerals on the surface of Mars. Included is a map of the global distribution of hydrated minerals detected by OMEGA between -50˚ and 50˚ latitude, as well as OMEGA observations of clays and hydrated minerals in Mawrth Vallis and Terra Meridiani, two regions that attracted much attention during the landing site selection workshops for the MSL. For those less interested in specific findings but more in their broader implications, there is a synthesis section that investigates many aspects of lithology and geologic processes, including aqueous alteration, stratigraphic relationships, sedimentary structures and processes. This section also includes an investigation of the implications for astrobiology, and looks at the characterisation of potential habitats and the types of biosignatures we might expect to find there. On the whole, this is a strongly multidisciplinary reference book that contains a lot of technical information, all pitched at a high scientific standard. The bulk of it may at first seem inaccessible to non-experts. However, most of the papers are written in such a way as to make it possible for the non-expert to gloss over the details, while still developing a feel for the essential points. Anyone with some background in planetary science, geochemistry, astronomy, astrobiology or space exploration stands to learn an extensive amount about the state of the art in Mars science at present. Over the summer I used this book extensively in a research project carried out at ESA/ESTEC in the Netherlands. It was a fantastic resource for my work on the selection of landing sites of astrobiological interest for Mars landers and sample-return missions. The short introductory section, which places the observations in context and gives a background to the current state of science in this field, was effective in getting me up to speed and priming me for the more technical information which was to follow. After ploughing through the dense but rewarding information that constitutes the bulk of the book, I did, however, feel wrapped up in many loose strands of information that due to my amateur status in this field were not quite joining up. The synthesis section at the end really knitted these all into place for me, such that I could then appreciate the relevance of the other sections in relation to each other. I would thus advice students who use this book to keep an eye on this section, and perhaps even read it first, if they are to fully comprehend the significance of the more technical sections. The hot topic at the moment is whether Mars, at some point in its history, has met the environmental requirements for supporting a biosphere. With the Mars Science Laboratory and ExoMars soon to visit the Red Planet, we are technologically on target to answering this question. In this context, the science of the Martian surface is as topical as ever. The landing site selection workshops for ExoMars will commence in 2009, and observations such as these will greatly inform this process. A reference book like this would therefore be great to have at hand for both experts and students, as we follow the progress of our next European mission towards finding a destination on the surface of Mars.